Risk is an integral part of trading. This is due to the fact that market prices are never predictable with complete certainty. Therefore, the outcome of a trade transaction, whether good or bad, cannot be guaranteed. Traders perform transactions in an environment of high market uncertainty and are always exposed to the risk of losses. But risk is not just a matter of fate. It is something that traders can actively control with their decisions using appropriate risk management tools. Proper risk management is a key factor to success and profitability in trading. It results in a higher chance of achieving sustainable profitability over the long-term. In this article we’d want to focus on market risk - the risk of unpredictable changes in market prices - and discuss how to manage market risks when trading cryptos. Risk, broadly speaking, is exposure to uncertainty. As a trader, you become exposed to market uncertainty when you enter a trade. Uncertainty results from the fact that the outcome of your trade transaction is unpredictable. Therefore, in crypto trading, risk is about the chance of a loss occurring when the price moves against your market position. Here we identify the types of risks in crypto trading. It is, perhaps, the most important paragraph in this article, so pay a particular attention to it. In next paragraphs, we discuss each of these risks in turn and identify proper risk management techniques for every type of risk. In trading, leverage is an extremely important concept. The use of leverage has become a standard practice for traders on all markets worldwide. It is used to magnify returns and offers the possibility of high payoffs from small investments. But, when used inappropriately, leverage can become a destructive force for your trading account. Why? Because, although leverage provides a great opportunity to magnify potential gains, it also magnifies potential losses. Entering a trade with high leverage can be dangerous, especially, when you enter with a high trade size and your margin level declines below 100%. Such trading can make you unable to survive periods of high volatility. Even if your price projection turns out to be correct, your trade account might be closed at a margin call, should there be a temporary downturn in an opposite direction. Using a moderate level of leverage, such as from 1:5 to 1:10, would be a proper approach to risk management. In addition, if you’re using high leverage, you should maintain adequate free margin on your account, sufficient to survive unpredictable short-term deviations in price. In any case, the level of leverage should be suitable for a particular trading strategy. Even when using a moderate level of leverage, you may want to increase the size of your position in order to increase the magnitude of potential gains. But, while increasing the position size, do not forget to monitor your margin level (the relationship of free margin to required margin). An optimal margin level would be above 200%, meaning that 50% of your equity is invested in cryptos and 50% remains in cash. This would provide sufficient flexibility for you in opening additional positions, should you want to. When using this technique, if your position generates a loss, you won’t be locked in a loss-making position with your entire deposit. This risk management advice resonates with a well-known concept of investment management called diversification. In simple words, diversification means that you should not “put all eggs in one basket”. Trading with adequate margin level, such as 200% and above, will provide you with sufficient flexibility and diversification. A stop order is, perhaps, the most important mechanism of risk management in crypto trading. Traders often call stop orders ‘stop-loss orders’ because these orders are used to limit losses on market positions. For example, a trader who has bought Bitcoin at $3,500 may want to limit the maximum possible loss to $500. In order to do that, he should set a stop-loss order at $3,000. If the price falls below $3,000, the stop-loss order will become valid and will be executed immediately at the best price then available in the market. After it is executed, the market position will be closed and the trader will realize the net loss of $500 (calculated as a $3,000 close price minus a $3,500 open price). Despite the fact that a trader would receive a loss, as shown in this example, he would have protected his account from potential excessive losses, had the market price continued to fall further below $3,000. In the example above we described the application of a stop order to a long position. You can similarly use a stop order to limit potential losses on a short position. When a stop-loss order is placed for a short position, it will not be executed until a market price rises above the stop price. If the market price rises above the stop price, the stop condition will be satisfied and the stop-loss order will be executed immediately at the best price then available in the market. By placing a stop-loss order for a long position, the trader creates an instruction (an order) to close the position if the market price falls below the stop price. Similarly, for a short position, the trader creates an instruction to close the position if the market price rises above the stop price. The stop-loss order is stored on the broker’s server. Therefore, after it’s been placed, it will be executed automatically. It is worthwhile noting that the stop-loss order does not guarantee a stop to losses at exactly the stop price. When the market is falling quickly, a price gap may occur (i.e. an abrupt change in price), and the stop-loss order may be executed at a price slightly worse than that specified in the order. With respect to cryptos, being liquid means being able to be easily converted into cash. Less liquid cryptos are those that have a thin market and a lack of investor interest. Although lack of liquidity can offer benefits to long-term investors, such as the opportunity to buy cryptos well before everyone else sees that it is an attractive investment, liquidity risk is a negative factor for active traders. To avoid liquidity risks, you should trade only the most actively traded cryptocurrencies. This will ensure tight spreads and high execution speed of orders. In addition, technical indicators work much better on actively traded (i.e. highly liquid) markets, which is an important consideration if you’re using technical analysis in making trading decisions. All of these cryptocurrency pairs are available for trading at monfex.com! Trading these highly liquid cryptos is a proper approach to risk management. In trading, volatility is a very important concept and is a measure of risk. trading. Specifically, volatility measures the average range of price fluctuations for a particular time period. High volatility translates into a high risk of unpredictable and sharp price movements. Highly volatile market is associated with a highly noisy market, on which short-term price fluctuations significantly distort the long-term trend. Price volatility usually increases sharply in periods, when major fundamental news are issued. Such news are able to impact the price of a trading instrument. With respect to crypto, examples include major economic, geo-political or technical news, affecting the demand for or supply of a particular cryptocurrency. 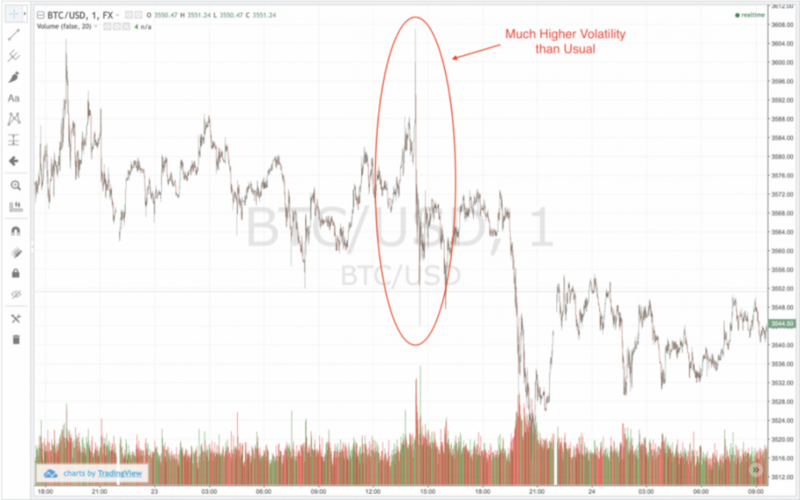 Trading during times of high volatility becomes risky, because the amplitude of price fluctuations, often unpredictable and sharp, increases dramatically. Therefore, trading under normal market conditions and avoiding periods of high volatility is a proper approach to risk management. To achieve success in trading, traders develop trading strategies, designed to generate profitable trading signals. Without a trading strategy in place trading becomes synonymous to gambling, which represents a significant risk. As a trader, you should strive to trading strategy. Each strategy is based on a particular forecasting model or a set of rules, suggesting to a trader when to buy or sell a particular cryptocurrency. Developing a trading strategy, supported by a consistent and rules-based approach to market analysis, will make you a profitable crypto trader. Trading with a strategy in place is an integral part of proper risk management. Always trade with a trading strategy in place. Avoid gambling. We encourage you to apply these risk management tools as a formal, systematic process. This will help you achieve not only your financial goals by being a successful trader, but also the ultimate end result of happiness by being successful. Remember that a trader with a risk management strategy in place, in which risk is integral to every trade transaction, will perform better in the long-term, in good times and bad, as a result of better decision making. To begin trading cryptos you need to open a margin account.